Our company is engaged in offering a comprehensive range of Wireless I/ O Gateways For Industrial Sensor Networks. 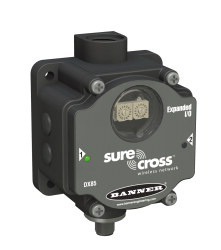 The most basic SureCross® sensor network includes a Gateway system controller and one or more Nodes that monitor I/O in remote locations. A SureCross Gateway is the wireless network master device used to control network timing, schedule communication traffic, and hold the configuration for the entire I/O sensor network. Similar to how a gateway device on a wired network acts as a “portal” between networks, the SureCross Gateway acts as the portal between the wireless network and the central control process. Every wireless I/O sensor network requires one Gateway device. Gateway models are available with discrete I/O, analog I/O, and a mix of discrete and analog I/O. Models ending in C use external terminal blocks instead of internal terminal blocks. These "C" models are Class I, Division 2 certified when installed in a suitable enclosure. Certifications are listed on the Classified Areas page. Refer to the 3D Models page to download AutoCAD, STEP, IGES, and PDF models. The Wireless I/O Network Manual is the full product manual for the DX80 devices and contains detailed information about the menu system, operation, installation, maintenance and repairs, troubleshooting, accessories, and the agency certifications for these devices. Manual 132607 For a basic description of how antennas work, how to connect a remote antenna system, and the differences between omni and Yagi antennas, refer to Antenna Basics. There are many possible installation configurations for your wireless network. Refer to the System Layouts webpage for a few examples or download the System Layouts document for more detailed examples of some wireless networks. We bring forth a comprehensive range of DX70 Point to Point. 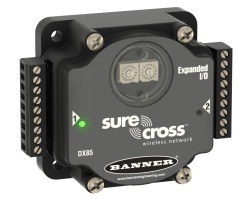 Sure Cross DX70 radios deliver an economical, dedicated wireless industrial I/O solution. A pair of configured Gateway and Node modules with direct I/O mapping offers plug-and-play installation. 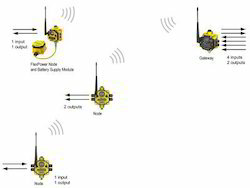 The DX70 models offer high-performance, low-cost wireless sensing with secure bidirectional communications in remote locations, making it an exceptional solution for a wide variety of applications such as Remote data acquisition, Remote monitoring of towers or tank farms, Loading dock occupancy monitoring, Physical plant energy monitoring, Water tank level detection, Train car location monitoring and marshalling in train yards, Parking ramp payment kiosk control. We bring forth a comprehensive range of Wireless I/O Nodes For Industrial Sensor Networks. 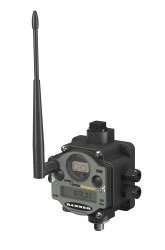 Data radios are used to extend a communication network. Serial radios connect a Modbus control system to one or more DX80 Gateway devices acting as Modbus slaves. Data streams appearing on the serial input of one radio within the network are reproduced on the serial outputs of all other radios in the same wireless network. Ethernet data radios are used to create point to multipoint wireless Ethernet networks. MultiHop Radios with inputs and outputs are also available. Please refer to the SureCross® MultiHop Radio webpage for a complete listing of models, I/O combinations, and datasheets. We bring forth a comprehensive range of Sure Cross Performance Wireless I/O Gateways. These SureCross® Performance Gateways are designed to function with the SureCross Performance Nodes, but may be also be configured to work with the existing DX80 Nodes. Refer to the 3D Models page to download AutoCAD, STEP, IGES, and PDF models. Download the DX80 Quick Start Guide or Product Manual for more information about the DX80 and Performance products. Enhanced Gateways offer increased range in the 900 MHz frequency band, High density I/O capacity provides up to 12 discrete inputs or outputs or up to four temperature inputs (thermocouple or RTD). Universal analog inputs allow current or voltage to be selected in the field. We bring forth a comprehensive range of Surecross Power Supplies. For a printable list of all available antennas, accessories, and cabling, refer to the Accessories List. DX81 FlexPower® Battery Supply Module delivers and manages dc voltage from one 3.6V lithium D cell battery. Datasheet 131596. Replacement battery: BWA-BATT-001. DX81H FlexPower Battery Supply Module delivers and manages dc voltage from one 3.6V lithium D cell battery and used to power the polycarbonate housed Intrinsically Safe DX99 devices, datasheet 141517. Our company is engaged in offering a comprehensive range of DX85 Modbus RTU Remote I/O. The DX85 Modbus RTU remote I/O devices have a Modbus interface and are used to expand the I/O of a Gateway or Modbus host within the wireless I/O sensor network. Refer to the 3D Models page to download AutoCAD, STEP, IGES, and PDF models. There are many possible installation configurations for your wireless network. Refer to the System Layouts webpage for a few examples or download the System Layouts document for more detailed examples of some wireless networks. Our company is engaged in offering a comprehensive range of DX80 Gateways. The Sure Cross DX80 Gateway Pro combines, in one unit, the function of a Sure Cross DX80 Gateway with the ability to interface to Ethernet using Mod bus/TCP or Ether Net/IP™ protocols. The Gateway Pro has a serial port as well as an industrial Ethernet port. There are two basic models of the Gate way Pro: DX80P*T6* and DX80P*A6*. The Gateway Pro “T” models provide a simple interface to serial communication protocols such as Mod bus/TCP and Ether Net/IP. The Gateway Pro “A” models enable full configuration capability and access to many advanced settings for complete custom setup of the Sure Cross product line. This device can be used for complex mapping and to interface with existing PLC or DCS systems. Connect a Gateway Pro to a host system using the industrial Ethernet connection on the DX80 Gateway Pro. To connect the Gateway Pro directly to the host system without using an Ethernet switch box/hub, some host systems may require a crossover cable. By default, the Gateway Pro is configured to use Mod bus/TCP server. To use Ether Net/IP, connect the Gateway Pro to a managed switch. 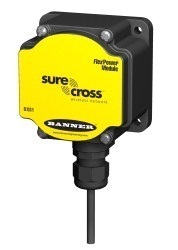 For more information, see Sure Cross Wireless I/O Product Manual or Host Configuration Manual, Power Supplies. Our company is engaged in offering a comprehensive range of Surecross Performance Wireless I/o Nodes. These SureCross® Performance Nodes are designed to function with the SureCross Performance Gateways, but may be also be configured to work with the existing DX80 Gateways. Refer to the 3D Models page to download Auto CAD, STEP, IGES, and PDF models. Download the DX80 Quick Start Guide or Product Manual for more information about the DX80 and Performance products. Enhanced Nodes offer increased range in the 900 MHz frequency band. High density I/O capacity provides up to 12 discrete inputs or outputs or up to four temperature inputs (thermocouple or RTD). New “environmental” housing option provides integrated battery and wiring terminals all in one unit. Universal analog inputs allow current or voltage to be selected in the field. Our company is engaged in offering a comprehensive range of Wireless I/ O Product Antennas And Antenna Accessories. Antenna Basics includes a basic description of how antennas work, how an omni-directional antenna differs from a directional (Yagi) antenna, and how to connect a remote antenna system with the Banner SureCross® industrial I/O wireless products. For general educational content about how antennas work, gain, and a description of the two primary antenna types, refers to the Antenna Performance white paper. We have also created a spreadsheet to help you select the proper antenna for your wireless network. Download the Antenna Gain Calculator to help you select the antenna, necessary cables, and the surge suppressor. For a printable list of the available antenna kits and enclosure kits that can be used with the SureCross product line, refer to the Antenna and Enclosure Kits list. For a printable list of all available antennas, accessories, and cabling, refer to the Accessories List. For more cables typically used with the SureCross products, go to the accessories page. Remote Installation - RP-SMA Antenna This antenna mounts remotely from the box, with the SureCross device mounted inside the box. This situation may be used either inside or outside the building, though a Yagi antenna is usually used in outdoors applications while an Omni-directional antenna may be used either inside a building or outside. This antenna mounts remotely from the box, with the Sure Cross device mounted inside the box. This situation may be used either inside or outside the building, though a Yagi antenna is usually used in outdoors applications while an Omani-directional antenna may be used either inside a building or outside. Looking for Wireless IO Gateways & Nodes ?